David Chalmers celebrates the 60th anniversary of the Queen’s coronation. In June 2013 I went up to Scarborough to catch up with David Chalmers for a talk he was giving about his work on the Crown Jewels. It took place at the Scarborough Art Gallery. There’s a nice write-up in The Yorkshire Post headed ‘Ice work if you can get it’. The picture of Her Majesty accompanying the article isn’t by David unfortunately. But the crown shown on this screen is one of his. David had only been working for a year as a professional photographer when, on behalf of Historic Royal Palaces, I commissioned him to take the photography for a new souvenir guide about the Crown Jewels housed in the Tower of London. But the work in his portfolio had a confidence and quality that belied his relative inexperience. And now that he has more than twenty years behind the camera it’s heart-warming to see that he still regards this project as a significant moment in his career. The guide’s production coincided with the jewels’ imminent move to a new jewel house. This added significantly to the technical and logistical difficulties. We could only shoot at night after the Tower was closed to the public. 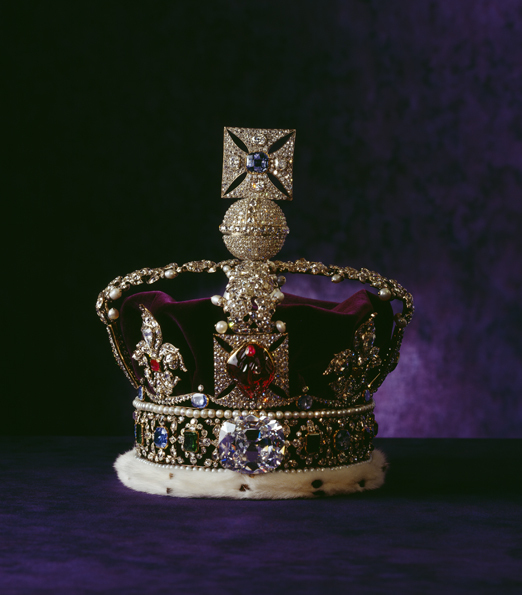 Unable to be removed from the jewel house, the Crown Jewels had to be photographed in-situ – a cramped environment at the best of times. No one other than the crown jeweller, David Thomas, could touch the jewels and even he wore white gloves at all times as he patiently followed instructions to move a piece a little more to the left… a little more… just a little more… too much… back a bit. a little more… (repeat for a few more minutes). Our shooting schedule was not based on a photographic ideal but instead had to fit in with a quite separate schedule relating to the cleaning of individual pieces prior to being put into storage for relocation to the new jewel house. A few pieces had to be brought forward in the schedule because they were due to go ‘on-tour’ to other collections. Consequently the same photographic set would be made and broken many times rather than allowing us the luxury of shooting all the items using a particular set in sequence. Fortunately none of these problems show in the final images. And in many instances David managed to convey a sense of volume, scale and space that simply wasn’t there in the old jewel house.